Whether you're an expert or a novice in email marketing, Mailchimp gives you tools to easily design beautiful campaigns. Choose one of our template options to sell products, promote your brand, or boost audience engagement. In this article, you'll learn the basics to design a campaign in Mailchimp. When you create a campaign in Mailchimp, you'll choose a template in the Content section of the Campaign Builder. The template you select will be the foundation of your design. To select a template, follow these steps. On the Template step, click the template you want to use. You can always go back later to switch templates. Choose from Layouts (Featured and Basic), Themes, Saved templates, Campaigns, or Code your own to begin to design your campaign. Featured templates were designed with specific goals in mind. Each template contains customizable content blocks you can use to promote new items, tell your brand story, send a personalized follow-up message, educate your audience about a specific service or product, and more. Our Featured templates use our drag-and-drop editor, so you can easily create customized campaigns to suit your needs. Our Basic templates combine blank layouts with the Campaign Builder's drag-and-drop editor, so you have you full control over the layout of your campaign. Basic templates are available in regular and full width versions. Full width templates extend the background of each campaign section across the entire width of the client it's being viewed in. We teamed up with some of the most talented designers on the web to bring you beautiful predesigned templates that are simple to use. Themes templates also make use of our drag-and-drop editor, so you can further customize your campaign design. This tab includes templates you uploaded on the Templates page of your account, and any campaign designs that you saved as templates for use in future campaigns. Select a template from Saved Templates, and edit the content and design how you want. Choose one of your recently sent or draft campaigns as the starting point for a new campaign. We'll create an exact copy of the campaign's content and design, so you can edit it as needed without starting over from scratch. If you have a custom-coded template, click Code your own to paste in your code, import it from a ZIP file, or import it from a URL. Include our template language in your code to edit the design of the campaign with our Campaign Builder. After you choose a template, you'll move on to the Design step of the Content section. Use content blocks to add and format text, upload images, link to files, and more. 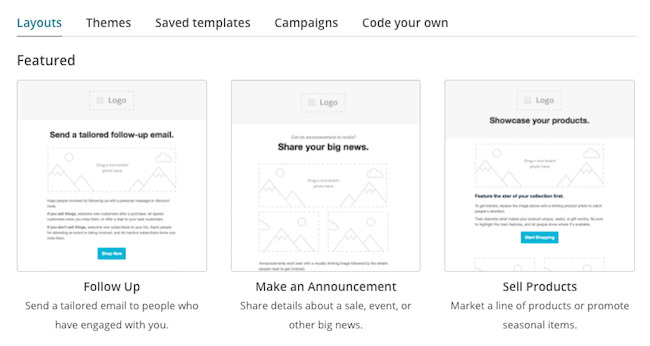 All templates show placeholder text and images to help you begin to design your campaign. Depending on the template you choose, you can add, delete, move, and replicate content blocks to create the look and feel you want. Our drag-and-drop editor allows you to duplicate, delete, and rearrange content blocks on the fly. Drag and drop a variety of content blocks into your layout and rearrange them to customize the look and feel of your campaign. The best way to add text to your campaign is to type it directly into the content block editing pane. If you prefer to work outside of the Campaign Builder, copy and paste your content from a simple text editor, like Notepad or TextWrangler. Avoid rich-text word-processing programs, like Word or Publisher. 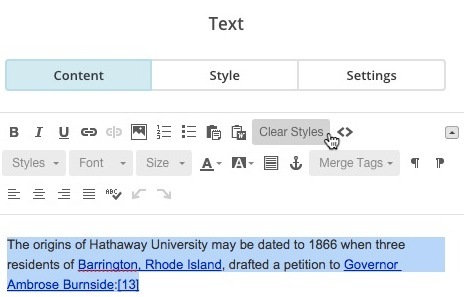 They add styling code to the text that can prevent your ability to style content in the Campaign Builder.If you want to copy content from a rich-text editor, website, or email program, click the Paste as plain text icon on the editor toolbar to add your text. If content has already been added to your campaign and you didn't use the Paste as plain text option, or if content doesn't update when you apply styling to your text, click Clear Styles and try again. Use the Clear styles option to remove any conflicting formatting or styles that were brought in when you added content. This only removes the formatting that's been applied to your text and does not remove the text itself. To clear styles from your content, follow these steps. Click the Text content block you want to edit. In the Content tab, highlight the text you want to change. In the editor toolbar, click Clear Styles. Styles and settings for your campaign design can be applied from a few different places. Each section in your email campaign is related to another in a hierarchy so the styles you set in one area of the Campaign Builder may affect other sections. Every template is divided into different sections, like the preheader, body, and footer. You can apply styles to these sections on the Design tab in the Campaign Builder. When styles are applied to a section, they are also applied to all content blocks in that section. If you want one of your content blocks to have different styling from other content blocks in its section, open that content block and set preferences on the Style and Settings tabs for that content block. Styles you apply here will override the style for the section that content block is in. Use the editor toolbar in each content block to fine-tune the styling on a line-by-line basis. Changes you make here will override any styles you've set for that content block or section. Once you're comfortable with the basics of designing a campaign, check out our Email Design Guide for more tips on designing for email marketing.